The researchers investigated the chain of events that activates the protein BAX, which is a crucial driverof apoptosis, the major form of cell death. Addressing a long-standing question in the field, theydiscovered that BAX is activated for cell death by transient interactions with so-called 'BH3-only' proteinsat two distant sites on BAX. The research, led by Dr. Michael Dengler and Professor Jerry Adams, was published today in the journalCell Reports. Apoptosis is the major way our bodies remove damaged or unwanted cells. Many different stimuli triggerapoptosis by turning on cell signalling pathways that activate BAX and its close relative BAK. ActivatedBAX and BAK create holes in the cell's energy factories, the mitochondria. Once mitochondria aredamaged, cells are compelled to die. Professor Adams said a long-standing question in apoptosis research had been how BAX is triggered tomove to mitochondria once cell death is triggered. 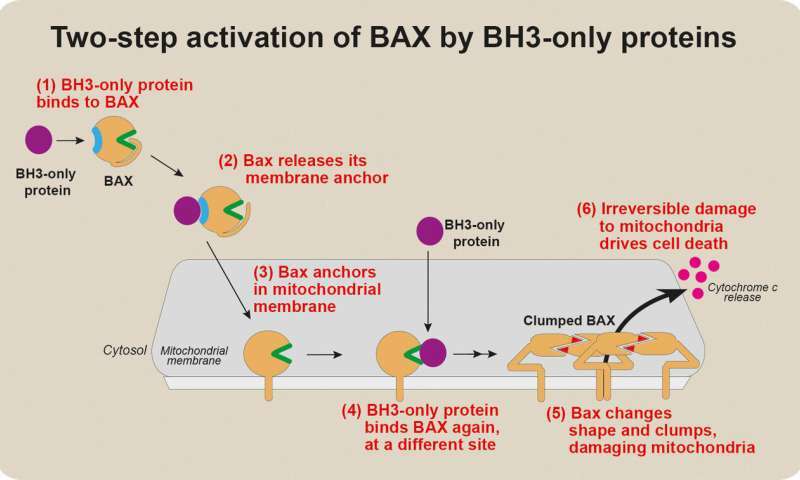 "The events activating BAX once it has embedded on the surface membrane of mitochondria have beenwell-characterised—we know that death-inducing BH3-only proteins bind to BAX, changing its shape todamage the mitochondrial membrane," he said. "There had been hints that BH3-only proteins are also the signal for BAX to move from its location in ahealthy cell's cytosol—the liquid interior of the cell—to the mitochondria, but the experimental datasupporting this were controversial and weak." To understand how BAX interacts with BH3-only proteins, Dr. Dengler and colleagues strategicallyaltered different regions of BAX, subtly changing the protein's structure. By comparing the behaviour ofthese mutant forms of BAX with that of normal, unmutated BAX, they could determine the function ofdifferent regions of BAX, he said. "We discovered that two different parts of BAX could bind to BH3-only proteins," he said. "Intriguingly,these sites functioned at different stages of BAX activation. "One site prompted BAX to move to the mitochondrial membrane. Binding of BH3-only proteins to thissite on BAX changed BAX's structure, releasing a 'tail' that anchors BAX to mitochondria. When BH3-only proteins bound the other site on BAX, BAX became able to damage the mitochondria." "The first, early activation step had never been well characterised, because it appears to involve atransient 'hit-and-run' interaction between BAX and a BH3-only protein. We think this first step might bea way that BAX activation can be fine-tuned," Dr. Dengler said. The research involved collaborations with structural biology and proteomics researchers at the Institute,aided by the Australian Synchrotron and the CSIRO Collaborative Crystallisation Centre. "Structuralbiology and proteomics were critical technologies for understanding how BAX is activated," Dr. Denglersaid. As well as explaining a key detail in how cell death is executed, the research may in the future lead tonew classes of drugs that modify BAX function. "BAX is a key mediator of cell death, and many major diseases involve either too little or too much celldeath. Our discovery may eventually underpin the search for drugs that promote apoptosis by activatingBAX, which may have potential for treating cancer. Conversely, drugs that block BAX activation couldhelp to prevent the harmful cell death that occurs in neurodegenerative disorders or stroke," ProfessorAdams said.